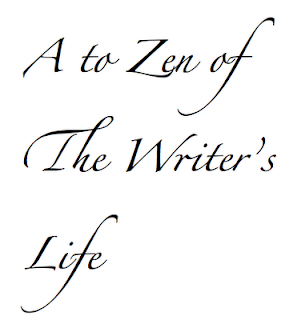 A while back I saw a poster called the "A to Zen of Life." It had "Dali Lama" written across it in cursive so I know it was totally legitimate Dali Lama quotes. 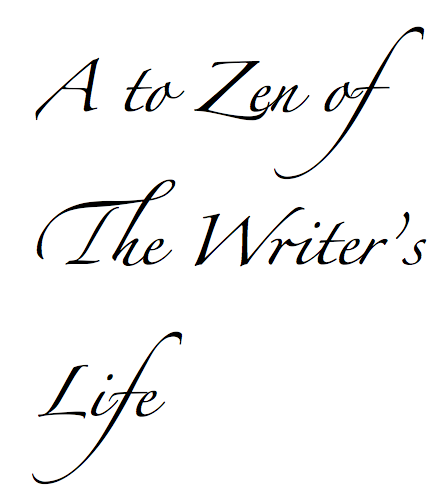 I thought that an "A to Zen of the Writer's Life" would be cool. Avoid negative people and habits, but don't confuse those who make you feel bad about negative habits for negative people, for those who call shenanigans on your shenanigans are more valuable than gold. Consider things from every angle. Your characters can't all be you. Don't give up. Don't give in. Don't stop. Empathy goes beyond intellectual understanding. You must have both. Fail. Fail again. Fail better! Life is not defined by your successes. It is defined by how you cope with your failures. Give everything you have to everything you write. Don't hold back. The well of creativity isn't a finite resource to be rationed. The more you use it, the fuller it becomes. If opportunity doesn't knock, create a door. Create that door like Giles did in Buffy the Vampire Slayer if you must ....with a chainsaw. Just keep writing. Just keep writing. Just keep writing writing writing. What do we do? We write write. Keep going no matter how long and hard the road seems. Something wonderful might be just around the next bend. Learn your craft. You're never too good to be better. Never cheat. Steal, of course, for that's what artists do. Lie, certainly, as long as your lies tell the truth. But never cheat. Open your arms to opportunities, but don't become so enamored with writing for a living that you forget the kind of writing you want to be doing. Practice makes perfect. Though in the words of Hemingway: We are all apprentices in a craft where no one ever becomes a master. Quality over quantity in everything you put out in the world. Read! Revise! Read! Revise! These two parts of a writer's life can't be underscored enough. Take criticism well....and all that that implies. Understand as much as you possibly can of the world, but do not satisfy yourself with a simple intellectual grasp. Visualize exactly what success looks like to you with as much concrete detail as possible. It is impossible to hit a target that you cannot see. When you meet with triumph or disaster, treat those two impostors just the same. X words are hard to weave into motivational messages. Make a bad pun if you ever do a list like this, like: "Xcellence in all you write to be read." Your ideas are not completely unique, but you are. You will bring that which is uniquely you to your projects. Don't be deliberately derivative, but don't worry so much about originality that you paralyze yourself. It's all been done before. But not by YOU. Zero in on what you really want and what really makes you happy. You may find that a rewarding and fulfilling hobby along with a real paycheck will make you happier person than struggling as an artist. That's okay. Do what makes you smile. Chase your bliss. Hey, I've seen that poster!!! You did a good job of turning it into a writer-focused list.